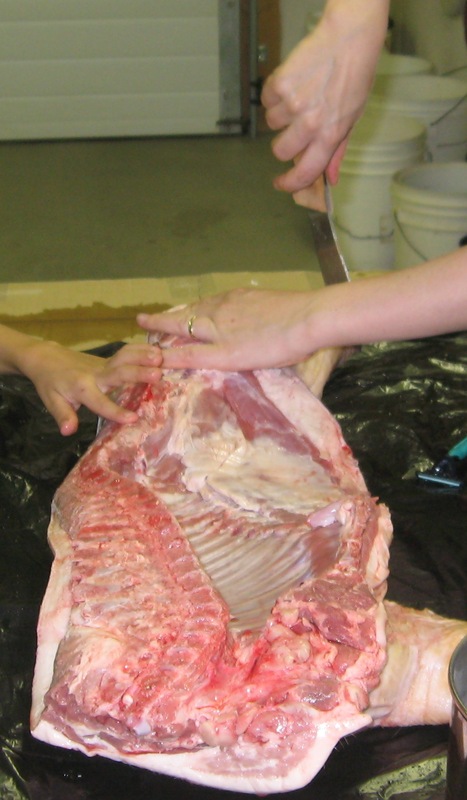 Warning – there are pictures of butchering below! Read on at your own peril. Many moons ago, Mr. Caffeinated mentioned that he’d love to roast a pig in a pit, Hawaiian style. Much research was done, thoughts were bounced, and nothing happened. Time went on, we’d mostly forgotten about it. 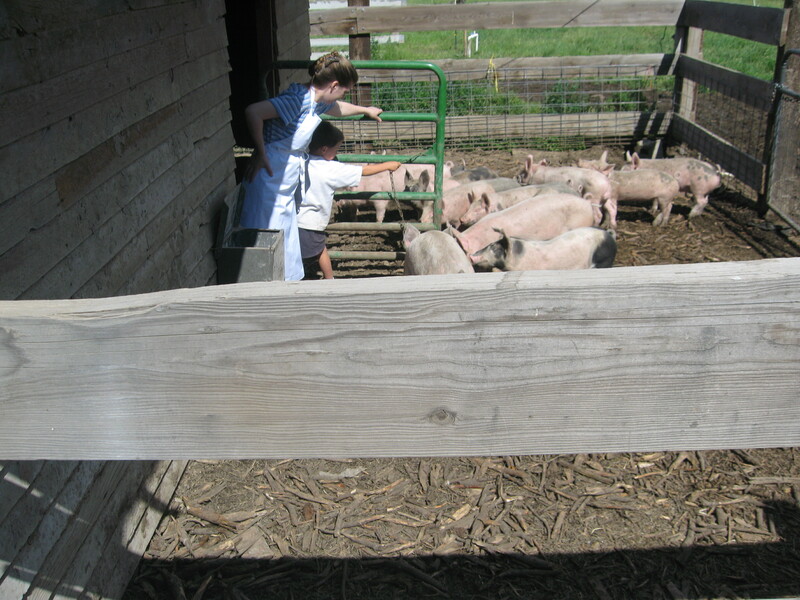 But one day in June, the farmer from whom we purchase our pork, lamb and beef emailed. A customer had placed an order back in January for 5 hogs for a luau. Two weeks before she was to pick them up, she cancelled her order. Those of you who purchase your meat direct should know that this is not done. Small farms base their production on advance orders, especially for animals that have a long time till maturity, such as beef, hogs and lamb. Now the farm was trying desperately to find customers for these hogs, as they were ready to butcher. Would we be interested? Well, yes actually… but on one condition: could we come and help butcher? This rather set the farmer aback. I guess this isn’t a request that they field all that often. Were we sure? Did we know that this was a fairly messy business involving things like guts, blood and gore? We butchered the hog at the farm around the 4th of July. It wasn’t too bad – if you’ve butchered chickens, hogs are just a bit bigger. My favorite part was at the very end, when we split the carcass down the back with a Sawzall (duly sterilized before and after, of course). Gathering up the pork and the kids, we hightailed it for our luau destination. 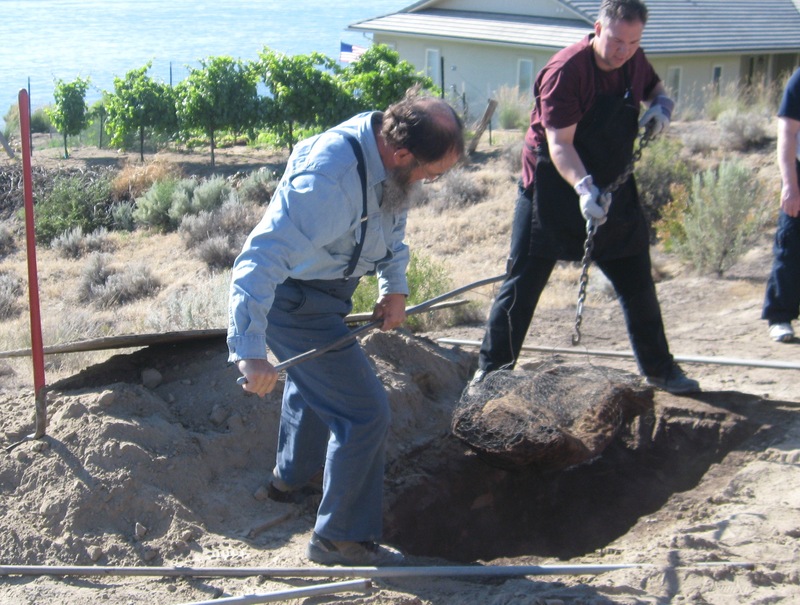 He dug a pit precisely 3x5x5. In sand. With squared corners. The man ought to have been a civil engineer. 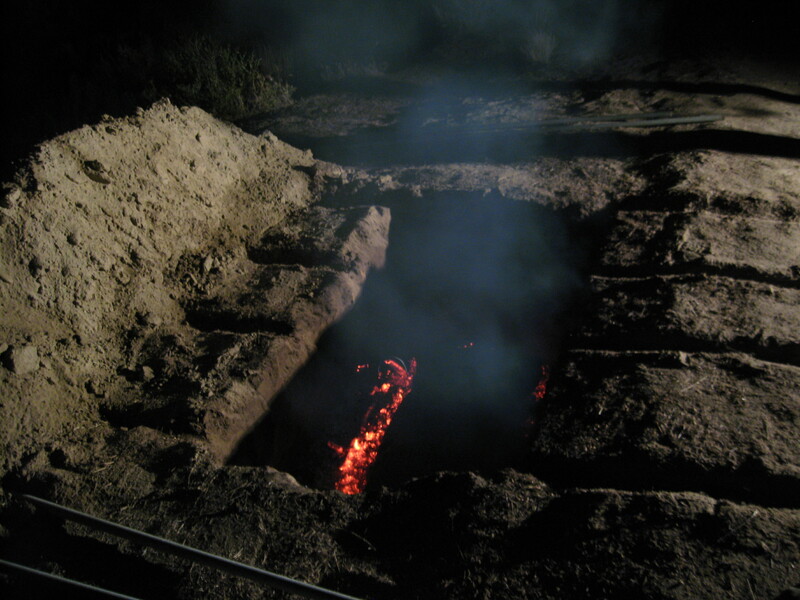 By the time we arrived around midnight, they had been burning cherry wood in the pit for about 10 hours. 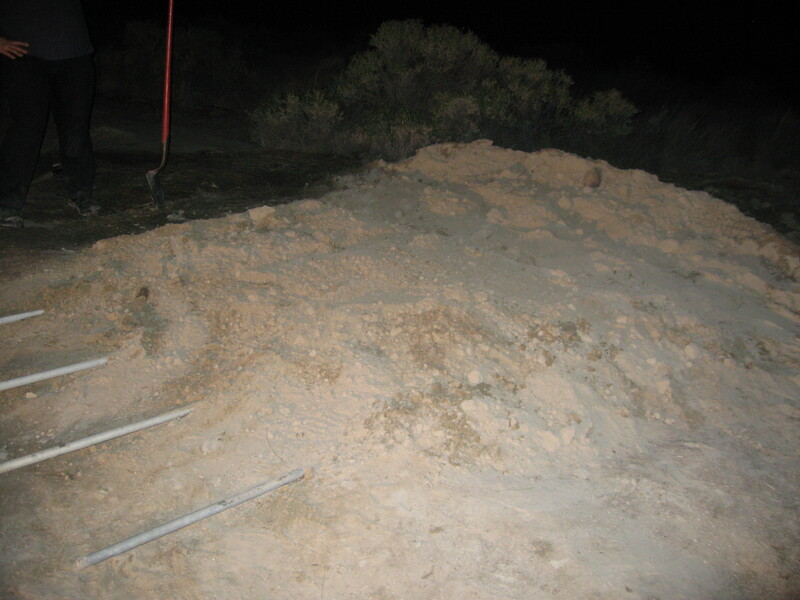 Hiking up to the pit in the dark was a bit unnerving. You know those cheap horror flicks where some grave appears, glowing an evil red? That’s what it looked like. My camera does not do it justice. 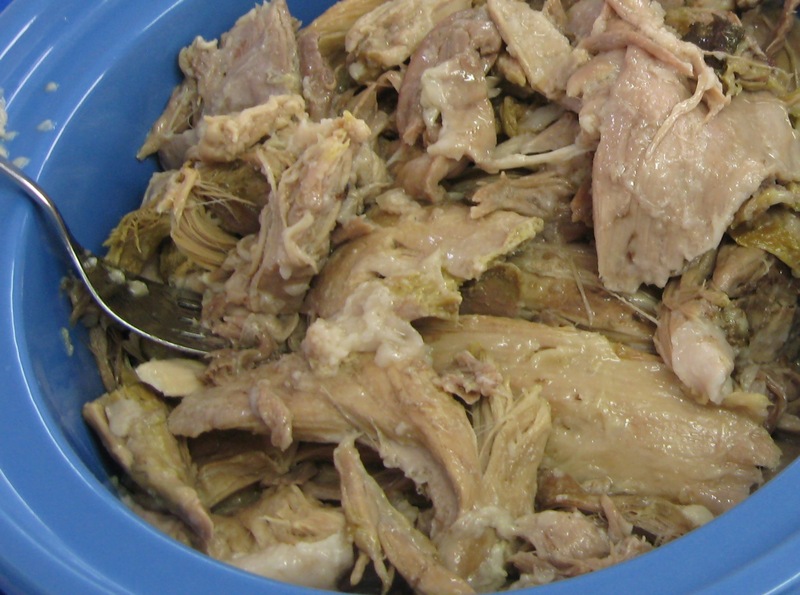 The biggest complaint I had read in reviews of luau pig was that it was never salted enough. So I made a brine of 1 quart water and as much salt as I could make dissolve – maybe 1 ½ cups or so. I then injected the pork with as much brine as I could make it hold. It doubled in size! I rubbed dry salt into the exterior as well. We laid down chicken wire, a layer of wet burlap, then a couple layers of foil. My mom brought in a wheelbarrow of lettuce from her garden. 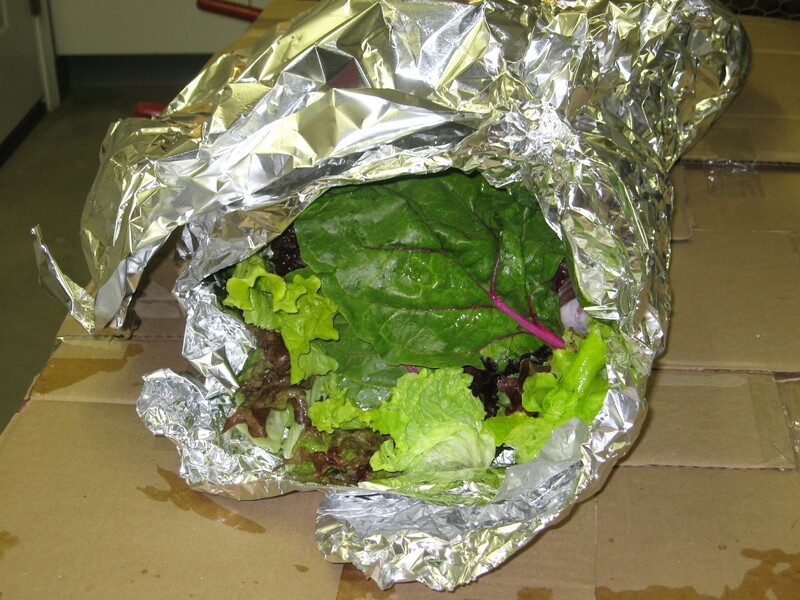 We didn’t have banana leaves, so we used a LOT of lettuce – it was a very full wheelbarrow. 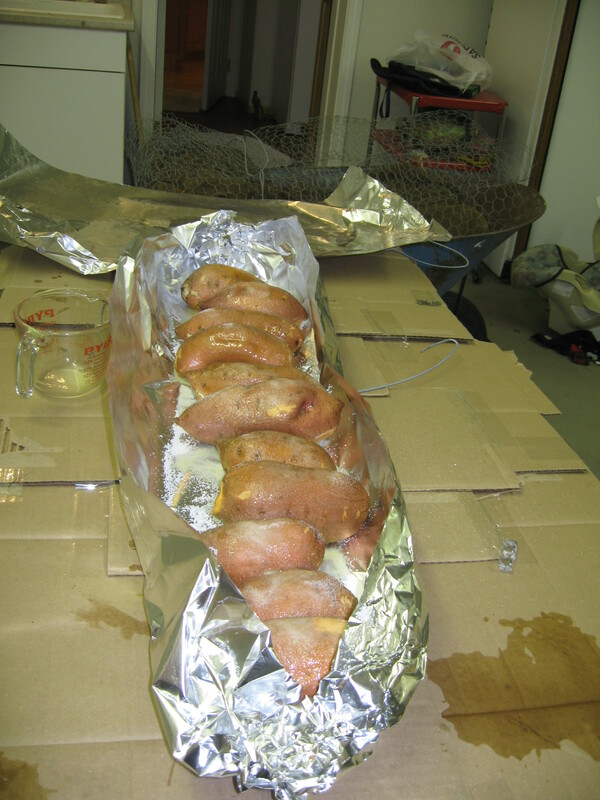 We also wrapped some sweet potatoes with salt in a separate packet. The pork and potatoes went in the middle of the whole ensemble, which was then rolled up and crimped shut. A couple of chains with homemade handles completed the parcel. This was duly trucked up the hill in the wheelbarrow and lowered in to the grave pit. 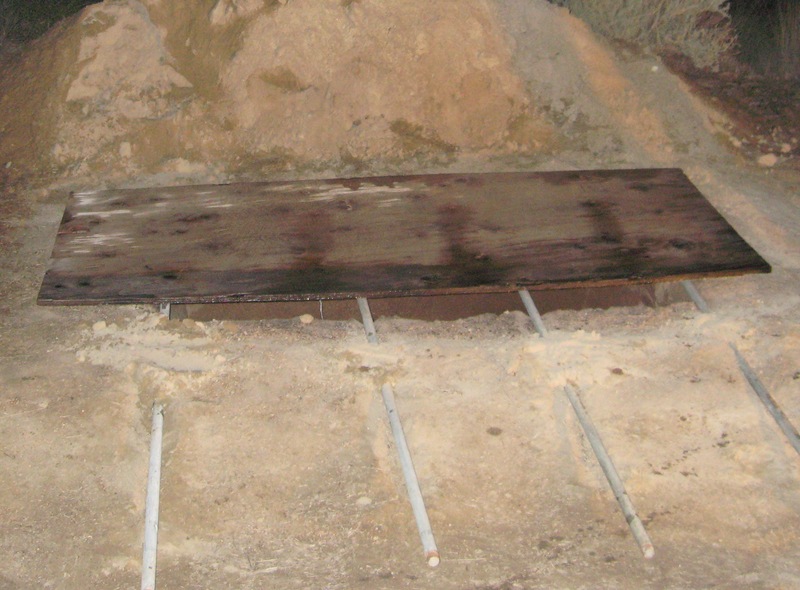 Steel pipe and plywood was laid across the top of the pit. 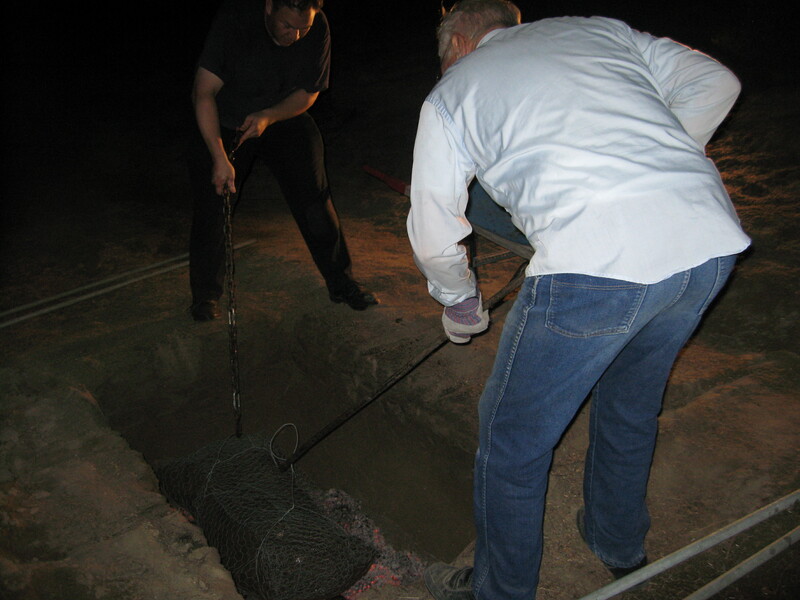 This was then buried and left alone for 16 hours. The next afternoon, the process was reversed. The excavated bundle was carefully disassembled. The pork just fell apart, and made the best pulled pork sandwiches I’ve ever had. It was moist, perfectly seasoned, and addictive. We only did half the pig that day, as I wanted to make an attempt at re-creating the idea of the pit roast in the comfort of my kitchen, sans shovels and sand. It worked, too! I’ll post about that some other time. Someday, we’d like to raise our own pork and have a permanent pit somewhere for an annual luau. It’s far more fun to lower a pig onto a blazing bed of coals and dig it out of the earth the next day than to simply take it out of the oven. A side benefit of the whole business is that I also have added ammunition for dealing with other people’s pre-teen boys. You know the type – life just has added sizzle if you can gross out an adult. They don’t know what to make of me. This entry was posted in Allergy-Friendly, Main Dishes, Projects and tagged butcher, luau, pig, pit roast, pork roast. Bookmark the permalink. 6 Responses to Luau Pig – or The Most Labor Intensive Way To Roast A Hog. Having a great time reading a few of your posts. I can’t believe you roasted a hog luau style, and helped butcher the pig! That is most impressive. 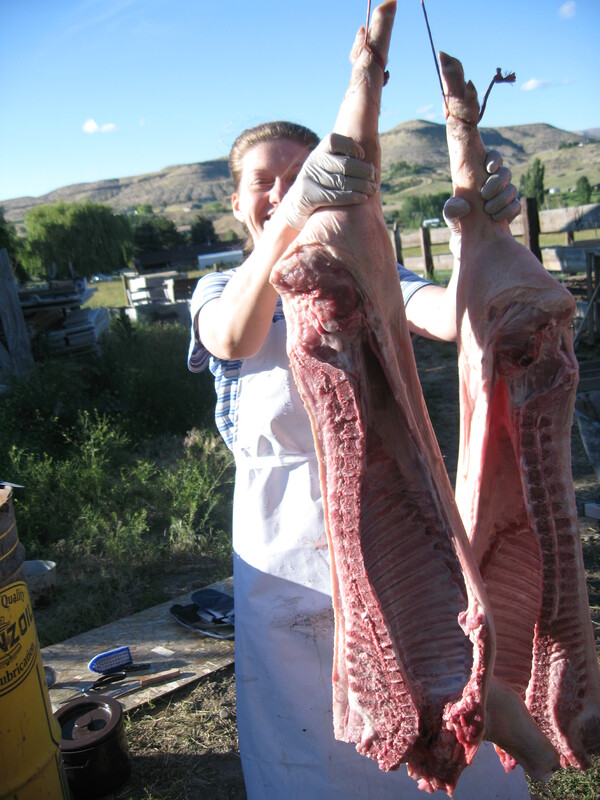 My family has done their own hog butchering since before I was born. But we have never tried roasting a pig like this. I’m going to send them this post to share the idea! It was a lot of fun, and it was very good eating! 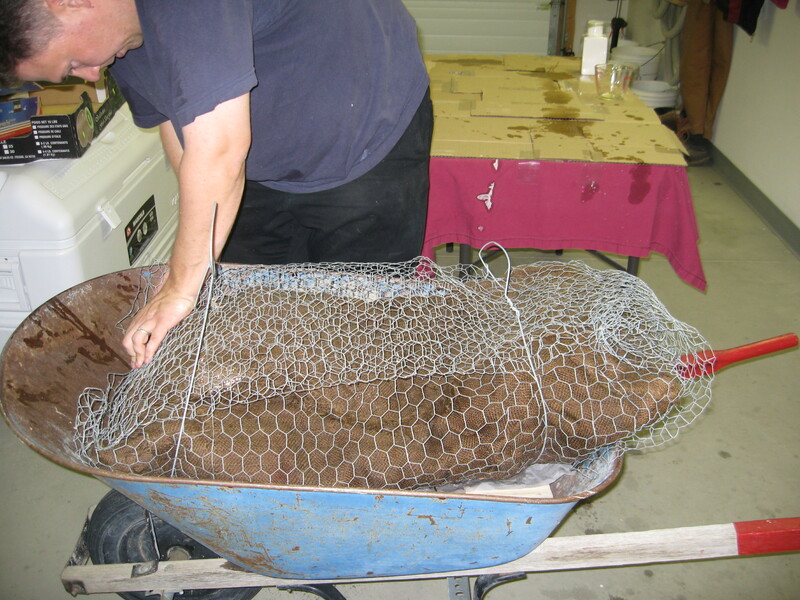 The pig was pretty small – the side was only about 30 pounds – but it made enough sandwiches for 15 or so people. If we do it again, we’ll definitely use a bigger hog. I need to post on how to do this in the oven and/or crock pot… I’ll have to defrost a section and cook that up sometime soon. If you do a pit roast…. post? 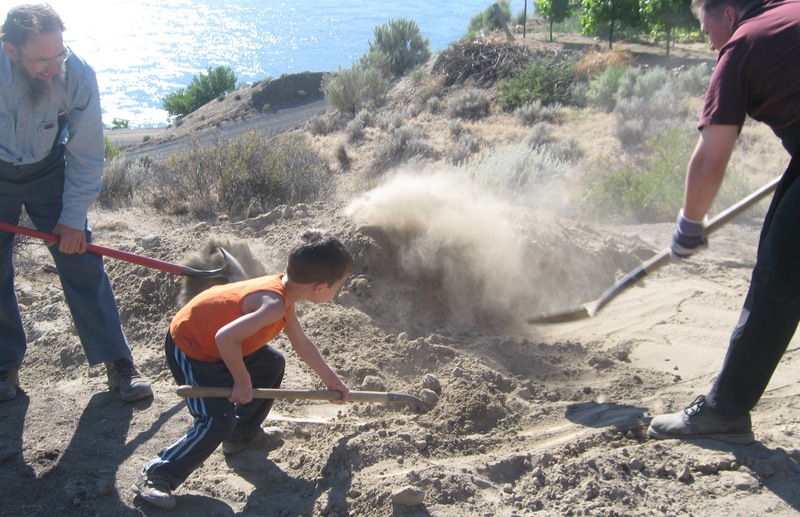 I’ll bet your family will come up with some shortcuts that we didn’t think of! Do you think Sand is required? Or is the premise only sealed in heat? Drooling…..can you also post a homemade BBQ sauce recipe? I think the premise is just having the earth hold the heat. In Hawaii, I believe they throw stones in the pit to hold the heat in better. Certainly the hole would hold its shape better if it were clay! I don’t have a homemade BBQ sauce recipe that I think trumps my favorite store-bought sauce. We really like Cattlemen’s Kansas City BBQ sauce (used to be called Cattlemen’s Classic), which I buy online. It used to be in stores everywhere here – even Costco – but I haven’t seen it in years. Now I get it on Amazon. I’d like to find a good sauce recipe that isn’t built on high fructose corn syrup… as soon as I do, I’ll post it!